I have been honored to serve the Nambé Pueblo community since October 2013. 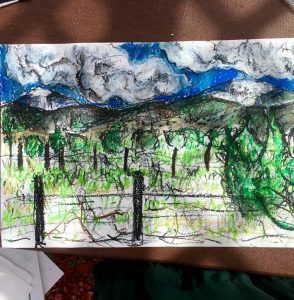 The reasons for my arrival to the little reservation nestled in a corner of the Sangre de Cristo mountains and hidden behind the winding backroads between Pojoaque and Chimayo, continue to be veiled in a mystery that deepens each day. I began as a volunteer there, and patiently watched my own love of art making and working with people unfold like the petals of an orchid gone dormant and come back after careful nurturing. Two years into my work with Nambé Pueblo, funding became available through a small pilot project called the “Children’s Capacity Building Project,” allocated from state funding through the New Mexico Coalition Against Domestic Violence. This project has provided Domestic Violence programs with the opportunity to build children’s services for children who witness domestic violence, and is quite unique in its flexible nature. Working as an outsider in a tribal community has been vastly perception enhancing. 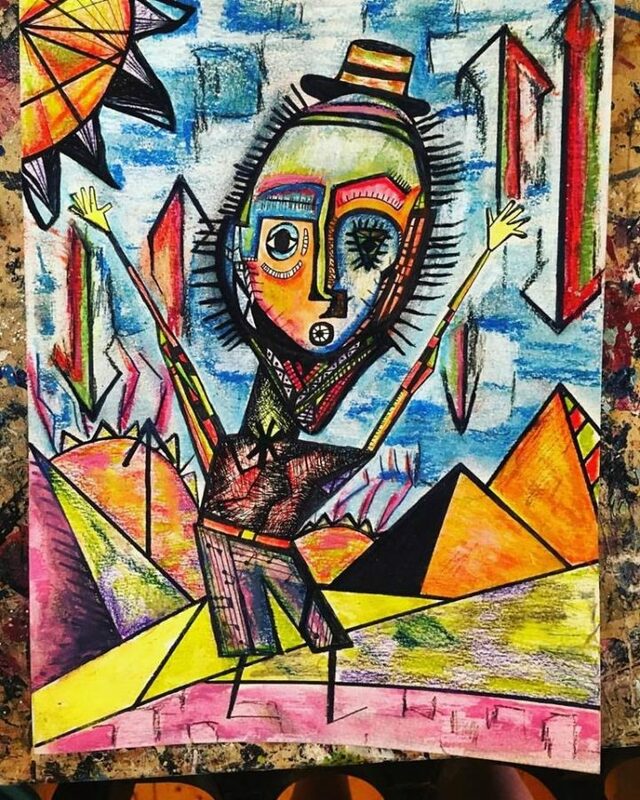 During my training at Southwestern College, I struggled with the ideals of the way that art therapy and counseling “should” look according to mainstream culture, and the way it could look within a totally different cultural paradigm and sovereign nation. I finally have found myself somewhere in the middle, respecting the culture of Nambe Pueblo and the boundaries of art therapy and counseling. Though I get paid for my work, my job has never felt like work. It has felt like much more of a calling. This does not mean that it hasn’t been extremely difficult. The very close relationships I have built with people in the community have been magical little worlds, filled with all the Beauty of life, which includes both joy and sorrow. 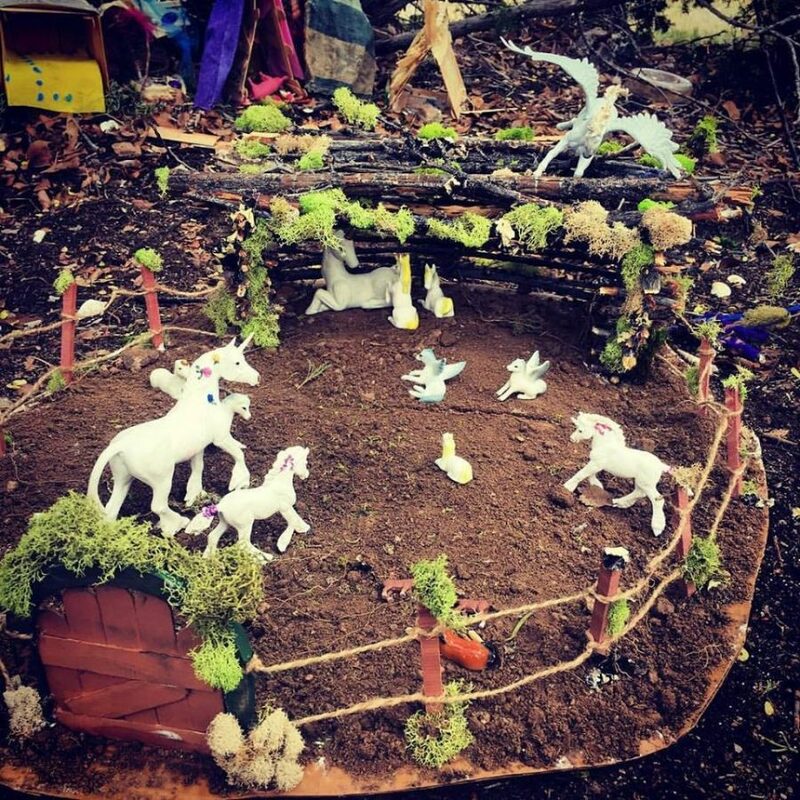 A year and a half ago, I lost one of my best friends in the community, who was my collaborator in building a tiny village of “faerie dwellings,” for Faerie O-Ween-Ge. Nothing could have prepared me for being called in to the hospital to say goodbye to him as he was being taken off life support, and to be included as a family member in a culture that I am not from during a tremendously sad period. I’d like to say this was a single devastating loss for the community, but unfortunately the effects and symptoms of historical trauma and oppression are extremely real and damaging to the lives of incredibly resilient, beautiful people. On the other side of the coin, I work daily with children, art, and play. It was Dostoyevsky who wrote, “the soul is healed by being with children,” and I could not attest to this more. Working with children has been tremendously positive and hopeful. 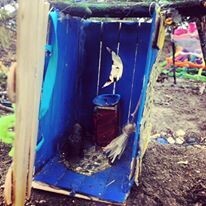 I am truly blessed to be able to collaborate with children in building space for possibility and hope in their lives. One highlighted project I work on with community members at Nambe Pueblo is “Faerie O-Ween-Ge.” “Faerie O-Ween-Ge” is organically happened through the art-based relationships between tribal members and myself. It is a village that contains tiny dwellings and magical objects left for imaginary creatures. More than bringing joy and imagination into the lives of my friends, I see the village as a metaphor for nurturing the hope of children and their ability to dream for the future. I find that the most important thing I can do for myself to enhance my work, is working on my own art and capacity to experience joy. I must draw, sculpt, and paint to understand art’s usefulness in my work. I have also learned that it is possible to do work toward enhancing my own capacity for joy. I do daily exercise to build happiness in my life. I try to joke as much as possible and to see beauty wherever possible. My time at Southwestern College was highly informative to my work at Nambe Pueblo, and I am grateful to have had the opportunity to work with such great people as Debbie Schroder, who has continued to be a great mentor in my life. I’d also like to take an opportunity to thank Dolly Parton for being my own personal Dolly Lama.